Calvin Roddie is faced with a wall of Stonehaven players as he looks for a breakthrough. 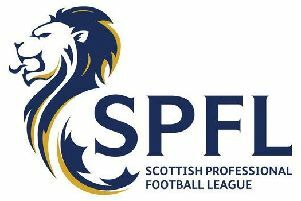 Colony Park lost 2-0 at home to Superleague side Stonehaven in the second round of the GA Engineering Inter-Regional Trophy on Saturday. In an entertaining match Colony fought hard throughout but were unable to overcome the Mearns side who scored twice in the final 25 minutes of the tie. Colony Park opened brightly with Gordon firing the first shot after four minutes which Roberson saved comfortably. Stonehaven responded immediately with a corner from which they had a header just wide. On eight minutes the visitors had a great chance to take the lead when Cook was through on goal. His shot beat Farquhar but trickled just wide of the post. Strachan had a chance for Colony when his run took him to the near post but Robertson saved his shot. The next chance fell to Stonehaven’s Armstrong but his effort was superbly blocked by Brown. Stonehaven continued to push for the lead and Farquhar made a great save from Reid when he was through on goal. Colony responded forcing two corners in quick succession, the first was cleared but from the second Ness had a deflected shot saved by Robertson. The visitors were awarded a free kick on 27 minutes just outside the box which Armstrong struck well and Farquhar saved. A couple of minutes later the keeper was again called into action this time saving a header from Reid. With the Hive continuing to attack Cook shot over on 33 minutes and then he laid on a chance for Reid but the cross ball just eluded him. In the latter part of the half Colony Park came more into the game with Morrison heading over the bar and Craib shooting wide. At the interval the score remained goalless. Stonehaven replaced Dunbar with Anderson at half-time. Colony Park started the second half positively. Ross put Strachan through on goal but the ball was cleared by the Hive defence. Ross then found Durno whose well struck shot was saved by Robertson. Roddie found Strachan in 55 minutes but his shot was blocked, resulting in a corner which was cleared. In 57 minutes Roddie was brought down just outside the box. The resulting free kick was cleared. Four minutes later Cormack replaced Cook for Stonehaven. Then Morrison headed over the bar. Stonehaven went in front in the 66th minute. From a corner the ball was cleared to the edge of the box where Cormack, not long on the park, struck the ball through a melee of players. Colony responded with a good run and shot from Roddie which brought a fine save by Robertson. In 72 minutes Dorrat replaced Gordon for Colony Park. The Inverurie side were responding well to being a goal down with Strachan going close and forcing a couple of corners. At the other end Farquhar brought off a great save from Cormack in 81 minutes. Stonehaven added a second goal in the final minute of the match. From a corner on the right Reid was able to make a run at the far post and he placed the cross into the net making the final score 2-0 to Stonehaven. Colony Park: Farquhar, Ness, Morrison, Durno, Brown, Davidson, Ross, Craib, Gordon, Strachan, Roddie. Subtitutes: Douglas, Dorrat, Bonarius, Mess, Marwick. Stonehaven: G Robertson, Schmid, Dunbar, S Robertson, McTavish, Pyper, Shand, Armstrong, Wyness, Cook, Reid. Substitutes: Cormack, Anderson, Pashley, Smith, Scully.